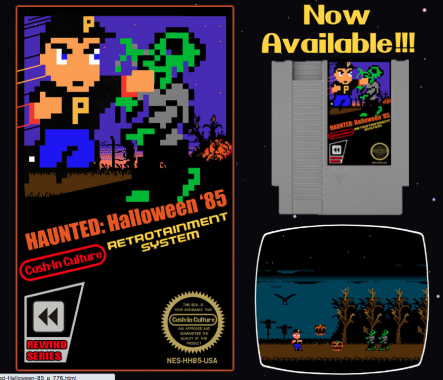 Last year we experienced the gripping tale of Donny Johnstown in the smash hit, Haunted: Halloween ’85 for the Nintendo Entertainment System. We watched on as he fearlessly battled his way through the town of Possum Hollow on Halloween night. Donny punched his way through grody zombies, ghoulish ghosts and killer crows to destroy the evil presence that was haunting his town. This epic story of heroism was told near and far. Join us as we are taken back to Possum Hollow for an all new adventure in this thrilling sequel. This year Donny will have some new friends to help him along the way and it’s a good thing because Harry is back with a vengeance and there’s no way that Donny alone could stop him. Prepare to have your mind melted by the most radical game you’ve ever played! In this amazing, new sequel Donny is one year older, wiser and tougher. He’s also been spending a lot of time jamming on the NES with Tami and the rest of the school’s NES Club. They’ve been honing their skills and preparing themselves for whatever gnarly adventures that might come their way. Interview with Tim Hartman coming soon.